Embroidery is one of the oldest forms of needlework. At present, more and more masters coming into this fascinating world of "drawing" thread. But the last stitch is made, the thread is pinned and you are in the arms of a beautiful... cloth. As of this cloth to make a decoration for your home or a wonderful gift? You just need to insert the embroidery into the frame. There are several options for embroidery design. The easiest and most expensive is to order a frame in the frame shop. This option makes more sense, if the embroidery is a large area. There are also embroidery kits manufacturers which offer to buy already matched in style and size frame and Passepartout. Another option is to purchase a frame in photoshop. It is inexpensive, but hard to find size and interesting shape. This drawback is simply eliminated by the selection of Mat. If you have enough imagination and skill, frame and passe-partout can be done independently. In this case it is possible to play with forms, materials and design. It is inexpensive and interesting, but time consuming more than anything. - Glue the embroidery with glue or double-sided tape, first carefully aligning it so that the cell outline was parallel to the edge of the cardboard. Inserted thus work very hard to dismantle, and adhesives are difficult to clean. - Pull the fabric from the back side threads. Stretch the thread between the opposite edges, as at very wide darn. This allows you to pull tightly, neatly aligned, and easy to disassemble if necessary. Be sure to route between the stretched surface and the glass Mat. Thanks to this, the embroidery is not flattened. Passepartout made of colored cardboard and decorate it any shaped window, good openings. Can covered with fabric, decorated with various materials. Also try to make a layered Mat, the layers of which are each other. Press the embroidery to frame the additional heel and fasten with nails or attached with clips. The picture is ready! The Foundation must be suitable in color to the canvas. If the canvas is white, is sandwiched between the base and embroidered white cardboard, if it is black or colored, respectively, black or colored paper. 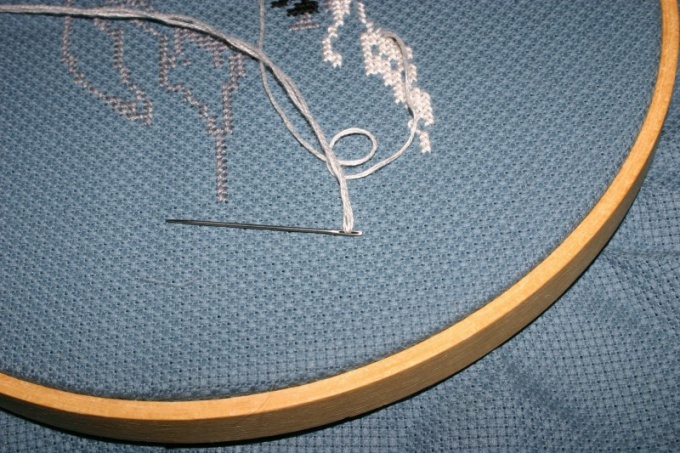 Embroidery with beads or other three-dimensional embroidery is better to draw a frame without glass.